and Humidity Monitoring and recording with phone call, SMS and email alert system for various server rooms and data centers. The device is a standalone device with own battery back up with one combined sensor for monitoring Humidity and Temperature. A SIM card has to be inserted into the device and the device can be programmed using USB cable to set the upper and lower limits for Humidity and Temperature. 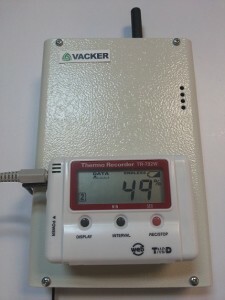 When the temperature or humidity goes beyond the programmed limits, it will activate a local alarm and after a defined duration if the problem is not attended or if not reset, it will make phone calls to 4 operators and deliver a voice message indicating the location and type of faults. The phone calls will be made continuously until one of them picks up the phone, listen to the voice message and press the # button on the mobile phone to acknowledge the call. Additionally if the problem is not attended after a certain duration eg. 15 minutes, the phone calls will be made once again and so on. Apart from the phone calls, SMS and Email alerts also can be programmed. The Email alert will show exactly the present temperature and Humidity condition. The sensor of this Temperature & Humidity Monitoring device is with a accuracy of 0.3 Degree Centigrade. Thermal Time Constant: Approx. 75sec. Response Time (90%): Approx. 190sec. Response Time (90%): Approx. 7min. Response Time (90%): Approx. 7min. Response Time (90%): Approx. 20sec. Measurements (alternating display), Power Warning Mark, etc. Vacker presently operates directly or through associates in UAE,Saudi Arabia,Kuwait,Oman,Qatar,Nigeria,India,Sudan,Ethiopia,Djibouti and other African countries.